WARNING!! THE CONTENTS OF THIS PAGE HAVE NOT BEEN UPDATED SINCE SEPTEMBER 2000. SOME LINKS MIGHT BE OUTDATED. Global air-sea flux of CO2: An estimate based on measurements of sea-air pCO2 difference. 1997. Approximately 250,000 measurements made for the pCO2 difference between surface water and the marine atmosphere, delta pCO2, have been assembled for the global oceans. Observations made in the equatorial Pacific during El Niño events have been excluded from the data set. These observations are mapped on the global 4o x 5o grid for a single virtual calendar year (chosen arbitrarily to be 1990) representing a non-El Niño year. Monthly global distributions of delta pCO2 have been constructed using an interpolation method based on a lateral advection -diffusion transport equation. The net flux of CO2 across the sea surface has been computed using delta pCO2 distribution and CO2 gas transfer coefficients across sea surface. The annual net uptake flux of CO2 by the global oceans thus estimated ranges from 0.60 to 1.34 Gt-C.yr-1 (click on the Figure) depending on different formulations used for wind speed dependence on the gas transfer coefficient. These estimates are subject to an error of up to 75% resulting from the numerical interpolation method used to estimate the distribution of delta pCO2 over the global oceans. Temperate and polar oceans of the both hemispheres are the major sinks for atmospheric CO2, whereas the equatorial oceans are the major sources for CO2. The Atlantic Ocean is the most important CO2 sink, providing about 60% of the global ocean uptake, while the Pacific Ocean is neutral because of its equatorial source flux being balanced by the sink flux of the temperate oceans. The Indian and Southern Oceans take up about 20% each. Following the "green carpet as it unrolls northwards" from low to high latitudes with the coming of spring was an important initial JGOFS activity, which stimulated the development and publication of a set of protocols for observing the ocean. JGOFS provided the co-ordination that allowed multi-ship intercalibration exercises to take place resulting in a new international standards and method protocols being established. The fact that the spring bloom sediments out in a rapid event that can be detected in bottom sediments is also a significant finding. In 1998, this Planning Group was re-structured into the North Atlantic Synthesis Group (NASG) marking the end of the fieldwork and the launching of the synthesis phase. Michael Fasham stepped down as Chair and Véronique Garçon was appointed the new leader. Link to the NASG web page. The amounts of carbon dioxide exported to the atmosphere are related to the climatic situation and vary by a factor of 4 between non El Niño and strong El Niño years. These variations are linked to the extension of the upwelling, the deepening of the thermocline by propagating Kelvin waves and the weakening of the winds in the eastern half of the Pacific, during El Niños. The biological pump is also dependent on the geographical extent of the upwelling, which follows the climatic situation. However, the biological pump undergoes less variation than the CO2 outgassing to the atmosphere due to the HNLC (High Nutrient-Low Chlorophyll) condition, which prevails in the equatorial upwelling. The HNLC paradox was intensively studied and interpretations of the results are still being debated over micronutrient limitation and grazing pressure. The hypothesis that micronutrient (iron) limit phytoplankton biomass was tested during two Iron-Ex experiments and that of grazing control was considered during another experiment. Primary production within the equatorial upwelling region undergoes mid-term (weeks) and short-term (diurnal) variations, which are on the time scales of equatorial and tropical instability waves that affect micronutrient inputs for photosynthesis and zooplankton grazing that controls phytoplankton biomass, respectively. With new and greater number of measurements, higher primary production values were confirmed than reported in the past. Now, in addition to the active (diel migrants) and passive (particle sinking) carbon fluxes, emerging models provide strong evidence for horizontal advection of DOC (dissolved organic carbon) in the export flux. A number of studies considered the oligotrophic warm pool in western equatorial region and the results provided a new view on the ENSO and short-term variabilities. In this region, the depth of the nutricline depends on the ENSO, and during El Niños and following wind events, productivity increases due to the shallow nutricline and the temporary wind forcing of nutrients into the euphotic zone. Such physical mechanisms affect the carbon cycle as well as the intensity of the biological pump. The Arabian Sea was chosen because of the massive seasonal changes in upwelling caused by monsoonal reversals of wind and current. This had been dramatically demonstrated by the Nimbus Ocean Colour satellite images, and unfortunately the delayed launch of SeaWiFS has hampered the work in this region. Early observations confirm that nitrate-rich waters throughout the study regions during the NE monsoon in January were depleted by March-April, with oligotrophic conditions prevailing during the most recent cruises. Therefore, initial results look promising and will be presented at the Villefranche Symposium. In 1998, this Planning Group was re-structured into the Indian Ocean Synthesis Group (IOSG) marking the end of the fieldwork and the launching of the synthesis phase. Field-work for the JGOFS Southern Ocean regional study (SO-JGOFS) has been carried out in two phases, the first of which was 1990-95. Future studies will be undertaken along side data synthesis, to address particular hypotheses and gaps in our knowledge. SO-JGOFS set out to improve understanding of carbon dioxide flux across the Southern Ocean. The region was thought to be a slight net source, based mainly on interpretation of atmospheric carbon dioxide gradients. SO-JGOFS cruises improved coverage, and the Southern Ocean now appears to be a CO2 sink of about 0.2-0.4 Gtonne C per year. It appears likely that this represents a change in the behaviour of the Southern Ocean, not just a better data set. Over half of the region is ice-covered in winter although most melts in summer. Very high, albeit transient, phytoplankton growth may occur at the melting ice-edge. Early biogeochemical models assumed that such blooms were the norm of the Southern Ocean. SO-JGOFS studies have shown that the system is more varied. Interaction of the ice-edge with hydrographic fronts gives rise to complex dynamics, now incorporated in models of ice-edge biogeochemical cycling under different environmental forcing. Understanding the effects of different environmental forcing on phytoplankton production is a central element of SO-JGOFS. Primary production High Nutrient -Low Chlorophyll environments like the Southern Ocean may change under different climatic conditions. Paleo-environmental indicators suggest that trace-element input as wind-borne dust may have enhanced production in the past, increasing biological carbon drawdown. At presents, phytoplankton growth in the Southern Ocean may be limited by low availability of elements such as iron. In 1998, this Planning Group was re-structured into the Southern Ocean Synthesis Group (SOSG) marking the end of the fieldwork and the launching of the synthesis phase. Julian Priddle stepped down from the Chair and Ulrich Bathmann was appointed the new leader. The Paleo-JGOFS Task Team (PJTT) held its first meeting on 13-14 June 2000 at the Institut für Meereskunde in Hamburg in order to define its objectives, terms of reference and to discuss the scientific orientation of the task team and the membership as well as to plan future actions. Participants of the first meeting were: Roger Francois, Rick Jahnke, Ann Holbourn, Laurent Labeyrie, Karin Lochte, Graham Shimmield, Paul Tréguer. The formation of a joint task team between the IGBP core projects PAGES-IMAGES and JGOFS was discussed during the IGBP Science Conference in Shonan Village in May 1999. The rationale behind the formation of the PJTT is the recognition that the knowledge gathered in both core projects can be fruitfully combined for a much more comprehensive understanding of the variability of physical and biogeochemical processes in the ocean on decadal to centennial time scales. The aim of this task team is to bring together the expertise on the biogeochemical processes in the present ocean available from JGOFS studies with the expertise on oceanic processes under past climatic conditions as identified by proxies gathered by PAGES-IMAGES. This will serve to promote synthesis and to stimulate new research. This initiative is very timely since synthesis efforts are being undertaken now within IGBP and new scientific directions are being developed. Go to the PJTT webpage. The JGOFS Scientific Steering Committee last April 1996 approved the organisation of the North Pacific Task Team (NPTT). The central purpose of the NPTT is to co-ordinate and facilitate national and international JGOFS and JGOFS related programmes that address atmosphere-ocean exchange, biogeochemical processes, and the role of intermediate water masses in the transfer of biogenic materials in the North Pacific. The specific tasks involve developing a structure for co-ordinating the field programmes including satellite remote sensing of ocean color and the subsequent synthesis and modelling efforts. The membership of the NPTT includes scientists or scientific organisations from Canada, Japan, China, Korea, Russia and the United States. Dr. Alexander Bychkov has co-ordinated the first phase of the NPTT, the Terms of Reference and the nomination of the NPTT membership. Early studies and models of global carbon cycle ignored carbon fluxes in continental margins1. Recently revised air-sea CO2 flux (2.2 PgC.yr-1)2 is as large as the estimated oceanic uptake of anthropogenic CO21. If this is true, it means that continental margins are sources of CO2 to the atmosphere due to riverine input of carbon3 and have little influence on the carbon budget in the open ocean. However, over the past decade, continental margin studies have revealed new information on the ocean carbon cycle, and it has now emerged that World’s ocean margins are probably weak CO2 sinks4. The possible biogeochemical and physical processes attributing to the sink include active biological uptake of CO2 in the summer, high CO2 solubility in the winter, and effective shelf transport and shelf edge export processes of particulate and dissolved carbon species, otherwise referred to as the "continental shelf pump". However, continental margins are more complicated and heterogeneous than the open ocean and cannot be adequately represented by biogeochemical provinces or coarse gridded maps of global ocean carbon fluxes. Nevertheless, the emerging view is that continental margins function as a weak net CO2 sink (~0.1 PgC.yr-1) by passing on some of the riverine carbon flux to the open ocean and exporting 10% of the shelf primary production, which represents as much as 20% of the global ocean biological pump. These findings throw doubt on the new estimate of air-sea CO2 fluxes (2.2 PgC.yr-1)2. Otherwise, the oceanic uptake rate of anthropogenic CO2 would be more than 2.8 PgC.yr-1. The Photosynthesis Measurements Task Team shall provide estimates of photosynthetic characteristics of phytoplankton necessary to JGOFS synthesis and modelling activities, and to complement JGOFS core measurements of primary production. The task team shall also set guidelines for such field measurements so that they can be compared between sites and investigators, liaise with the JGOFS Synthesis and Modelling Task Team, and promote measurement of photosynthesis characteristics of phytoplankton in JGOFS field version. A preliminary report was published in March 1994 (JGOFS Report No. 13), on basis of a workshop held in Carqueiranne, France, in September 1993. As a result of a second workshop, held in Banyuls-sur-Mer, France, in September 1995, a larger version, with extended discussion of the environmental and physiological causes for variability in P vs E parameters, and a list of definitions and recommendations for symbols and units, will be published. The second report will be finalised in November 1996. A third workshop was held in Longyearbyen, Svalbard, Norway, on 17-20 August 1997, primarily to deal with methodological questions related to the 14C method, e.g., gross vs net photosynthesis, POC vs DOC, etc. The work of the Task Team has been published as: Parameters of photosynthesis definitions: theory and interpretation of results. Sakshaug et al. 1997. Journal of Plankton Research 19(11): 1637-1670. This article has been reproduced as JGOFS Report Nr. 27. Members of the JGOFS Data Management Task Team (DMTT) assembled in Kiel, Germany, in June to review the status and availability of data collected during JGOFS field programs and to make plans for the future, last phase of the programme (2000-2003). The task team includes representatives from eight of the nations that participate in JGOFS. The task team has a new member from Germany. Joachim Herrmann of the Institut für Meereskunde (IfM) in Kiel, and who replaced Thomas Mitzka, joined his colleagues at the meeting. The primary concern of the DMTT is the availability and long-term archiving of the programme's data. Currently some JGOFS data are available on CD-ROMs, some online, and some only from the investigators who collected them. The estimates of the data available from DMTT participants are listed. Note that this list does not include the wealth of data gathered by JGOFS national projects not represented in the DMTT. DMTT members decided to focus their efforts during the remainder of programme on several specific activities. One is to seek funding for the production of a JGOFS master data set. The goal is to obtain all available JGOFS data from participating nations and investigators, to convert the data to a single format and to make them available online and on CD-ROMs. In addition, JGOFS projects and data would be described in the U.S. National Aeronautics and Space Administration's Global Change Master Directory (GCMD), including products from synthesis efforts. Another task is to set priorities for acquiring and archiving the data of countries represented in the DMTT and to create an inventory on the availability of these data. The coherent, interdisciplinary research conducted at BATS and Hydrostation S has resulted in a significant change in how we understand the elemental cycles of the Sargasso Sea and elsewhere. The interannual variability in winter mixing seems related to the ENSO cycle and the dynamics of the different spring blooms change in response to the variability in the physical forcing. In the summer, there is an anomalous draw-down of dissolved inorganic carbon (DIC) in the upper ocean, a drawdown that occurs in the absence of measurable nitrate (i.e., a non-Redfield stoichiometry). Furthermore, during the summer, the balance of all of the possible carbon fluxes in and out of the euphotic zone yields a loss of DIC that is only a third of the observed pattern in the temporal changes in the stocks of all forms of carbon. This observation challenges some of our basic assumptions about the cycling of carbon and challenges the accuracy of our approaches. Similar non-Redfield anomalies occur in the nitrate:phosphate ratios of the thermocline. An interpretation of this signal indicates that there is a net creation of "excess" nitrate, likely caused by nitrogen fixation in the overlying waters. The rate of nitrogen fixation is similar to the anomalous drawdown of DIC. Decade-scale variations in the dust deposition to the North Atlantic may provide both a regulation of the nitrogen fixation rate and a possible biotic feedback to climate. Dr. S. Emerson (Univ. Washington, USA) reviewed recent work on the new fixation of CO2 from 3 years of observations at HOT (results of this study are in press in Nature). The flux of biologically produced organic carbon from the euphotic zone of the ocean to deep waters below--the biological pump--is one of the important controls on atmospheric CO2. Accurate determination of this flux is critical to understanding and being able to predict future changes in the oceanic carbon cycle. 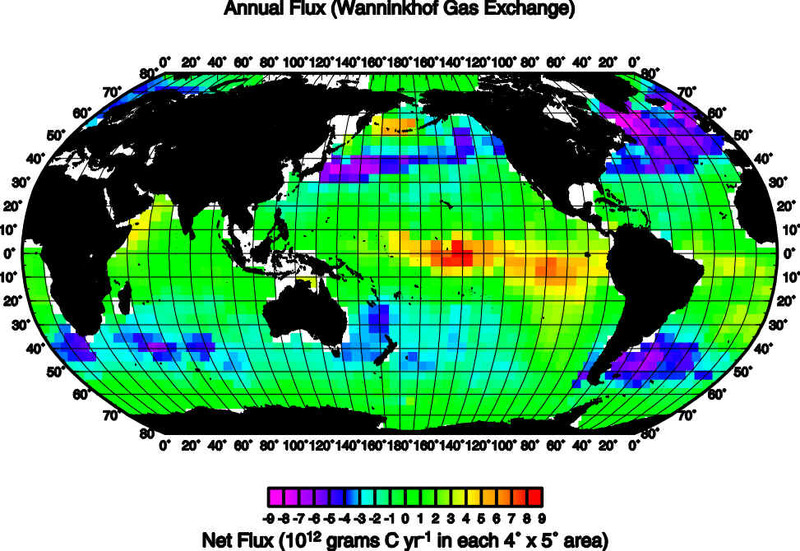 Since there are no standards against which environmental fluxes can be determined, an accuracy was accessed by comparing results from three independent experimental approaches for measuring the net annual export of organic carbon in the subtropical North Pacific Ocean at U. S. JGOFS time series station near Hawaii. The net biological production of oxygen determined from the mass balances of dissolved oxygen, nitrogen, and argon during three one year periods yields an equivalent carbon export of 2.7±1.7 moles C m-2 yr-1. Net biological carbon production determined by mass balances of dissolved inorganic carbon (DIC) and DIC d13C over a two-year period is 1.6± 0.9 moles C m-2 yr-1. Finally, measurements of the particulate and dissolved organic carbon fluxes yield an export of 2.0± 0.9 moles C m-2 yr-1. Uncertainties of these fluxes were determined by a Monte Carlo method that compounds the error estimates of the individual terms of the mass balances. Given the uncertainties, these fluxes are not significantly different and establish the attainable experimental accuracy to be roughly ±50%. If 2.0 moles C m-2 yr-1 is typical of the subtropical ocean, then this vast region, which is 60% of the ocean area, is responsible for a biological pump of 5-6 GtC yr-1. Assuming that recent model-derived estimates of the global ocean carbon pump (10-11 GtC yr-1) are correct, then the subtropical oceans, often considered a biologic desert, account for up to half of the global-ocean biological organic carbon pump. The most serious problem associated with interpreting these relatively large export production values in the subtropical oceans is identifying the source of nutrients to the euphotic zone. It has long been known that isopycnals with measurable inorganic nutrients are several hundred meters below the euphotic zone in the subtropical Pacific. However, continuous measurements of oxygen and nitrogen gas on a mooring at the time series station indicate that during the first half of 1997 there was a period of enhanced oxygen production when an eddy or front passed though the area. The period of excess oxygen saturation was associated with shoaling of the isopycnals and colour change indicating enhanced productivity. These observations can only be obtained only by continuous measurements from moorings and may indicate that nutrients are transported to the euphotic zone of the subtropical ocean by intermittent vertical pumping associated with eddies or fronts. This hypothesis will be investigated by continuing the mooring studies. This section is under construction. In the meantime, you can browse the ESTOC homepages in Kiel, in Bremen and in the Canary Is. Between 1990 and March 1995, the research project Kerfix realised the first regular multi-year acquisition of parameters related to the carbon cycle in the Southern Ocean at a time-series station at 60 miles southwest off Kerguelen Islands. The objectives have been: (i) to monitor the ocean/atmosphere CO2 and O2 exchanges; (ii) to understand which processes govern these exchanges; and (iii) to observe and interpret the seasonal and interannual variability of production, flux, decomposition and dissolution of carbon and associated elements at this location. In addition, micropaleontological studies describe the present and past flux dynamic in this ocean area, in order to improve the knowledge of the transfer functions of some oceanographic proxies. This multi-year acquisition study focused on one location is complementary to the Antares programme that provides coverage of the Southern Ocean, on a larger geographical scale and a lower time resolution. Gathering of data required for modelling of the primary production and the matter fluxes on a whole basin scale, considering the instance of the Southern Ocean wherein the ecological conditions are quite specific, with the primary production mainly resulting from the growth of siliceous algae, so that the carbon cycle is closely related to the silica cycle. The best way of studying the variations over one and several years consists in implementing a permanent station and observing changes in the physical characteristics of the water bodies, the currents, the particle flux at various depths, the chlorophyll content of waters. etc... Thanks to its subantarctic islands, at fixed station, Antarfix, provided with whole set of equipment for measuring the solar energy, located in the Indian Ocean, France is in a good position to implement such a station and to carry out regular visits of the moored instruments. This operation takes place by Kerguelen Islands. The Science and Technology Agency of Japan approved the KNOT station in the western North Pacific early this year. Joint efforts of Japanese JGOFS and the North Pacific Task Team resulted in new Core Research for Evolution Science and Technology (CREST) funding to support KNOT. The new time-series station is located at the southwestern margin of the subarctic gyre at 44oN, 155oE. Observations will start in June 1998. Nine visits are planned for the first year and 11 for the second. Research vessels from JAMSTEC, Hokkaido University, University of Tokyo, Tokai University and the National Institute for Resources and Environment will participate in the programme. Objectives include studies of CO2 uptake and its relationship to biological activity in the seasonally variable ocean. In addition to CTD sampling and JGOFS core measurements, plans include deployment of moored sediment traps at depths of 1.3 and 5 kilometres, a shallow optical buoy and free-drifting sediment traps. These observations will be supplemented by long-term data on the interannual variability of the vertical water structure, seasonal changes in CO2 exchange, and mixed-layer depth from Hokkaido University and M/S Skaugran cruise tracks. Interested scientists can attend the start-up KNOT workshop in March at the National Institute of Environmental Studies, Tsukuba.